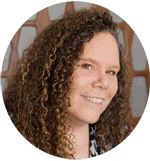 April 12, 2017 By This post may contain affiliate links. 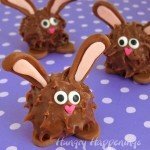 It’s so easy to brighten up your cereal treat recipe and to make them more fun. These Rainbow Rice Krispie Treat Pinwheels will be the hit at your next party or holiday celebration. Making rice krispie treats is so easy that transforming them into cute holiday treats or colorful pinwheels, in this case, doesn’t require a whole lot more effort. 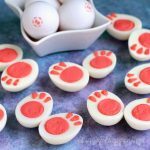 The basic recipe has three ingredients and a whole pan of the marshmallow cereal treats can be created and ready to serve in about 10 minutes. 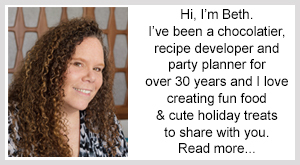 I love using the easy-to-make rice crispy treats as a basis for a lot of my fun food crafts, and have shared over 3 dozen different rice krispie treat food craft recipes with you over the years. 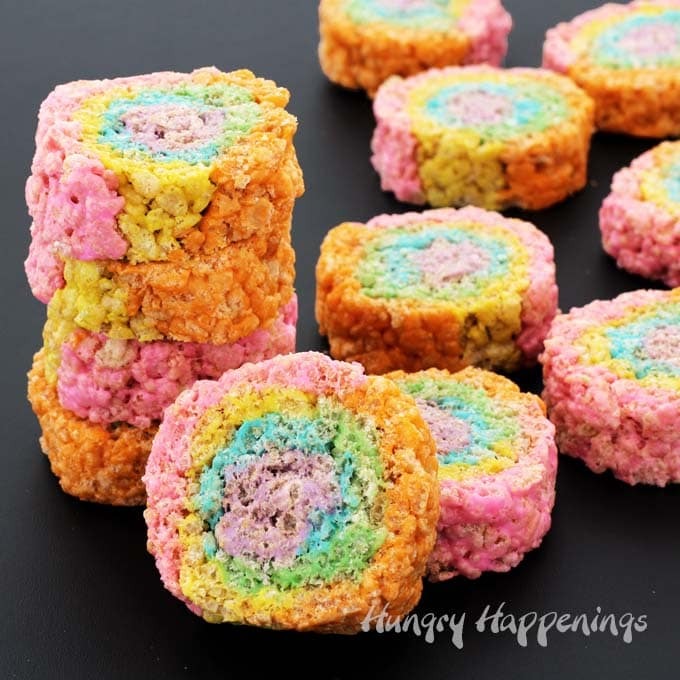 As I was making my Rainbow Peeps Cereal Treats last week, I started to think about other ways to make a festive looking rainbow cereal treat. Over the past year I’ve made and shared a few recipes for rice krispie treat pinwheels and thought I’d use that technique to make a rainbow swirled treat. These other treats were quite large and only used 2 or 3 colors. Being I wanted these treats to have 6 colors of the rainbow and be about the same size as a traditional marshmallow cereal treat, I had to find a different technique for rolling the pinwheels. 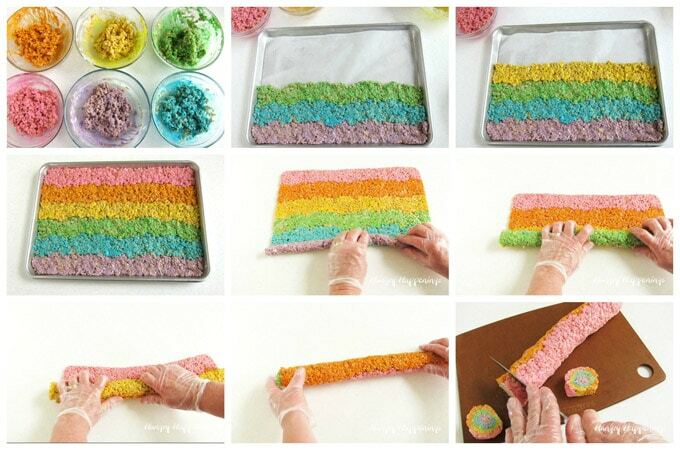 After many failed attempts I finally found that creating stripes of colors in a large 12×18 inch pan then rolling the thin sheet of rice krispie treats up into a long log before slicing it worked the best. This recipe from start to finish takes about 20 minutes. That may be twice as long as the traditional recipe, but look at the results. 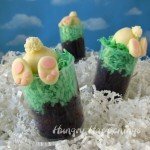 If you serve these at a birthday party or share them with family and friends on Easter or St. Patrick’s Day, I’m pretty sure everyone is going to be amazed. The swirls of color add so much fun to the cereal treats and each batch will make 12-18 treats, depending on how thick you make the slices. Line the pan with parchment or wax paper then butter it too. Melt 1.67 ounces of mini marshmallows (one heaping cup) with 1/2 tablespoon of butter in the microwave on high power for about 45 seconds. If needed, heat additional 15 second increments, stirring after each, until melted. Color using food coloring (start with purple). Stir in 1 cup of Rice Krispie cereal. Press into a 2 inch row along one of the long edges of the pan. Repeat creating blue, green, yellow, orange, and red/pink. Remove the rice krispie treats from the pan and begin to roll the purple row. Continue rolling until you have created a long log. Cut into 1 inch thick slices revealing all the colors. Watch the VIDEO TUTORIAL to see this process in action. I wore food handling gloves which I buttered well and nothing stuck to them. If you aren’t wearing gloves, butter your hands well. I find it easiest to use my hands to mix the cereal into the marshmallow. If you do that then be sure your hands are clean before mixing each color. You don’t want to blend the colors together. If you wear gloves that are buttered nothing will stick!!! If you want to see larger swirls of color, make your stripes going across the short side of your pan.This will also make much larger cereal treats. You can melt two bowls of marshmallows in the microwave at a time. Heat them a bit longer, if needed. 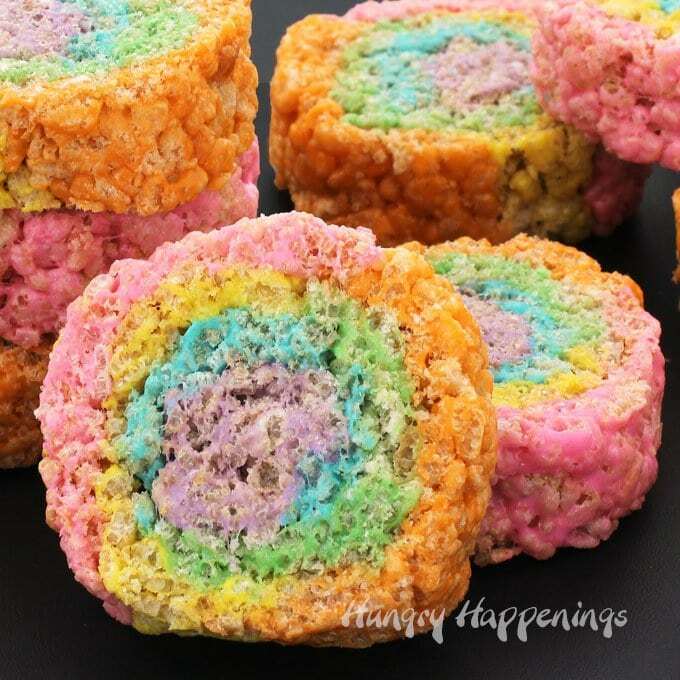 You can find items needed to make these Rainbow Rice Krispie Treat Pinwheels on Amazon.com (commission earned for sales). Bright swirls of rainbow colored cereal treats. Run a line of butter around the inside edges of a 12 x 18 inch baking pan. Set a piece of parchment or wax paper down on the pan then rub more butter over it. Equally divide the marshmallows (a heaping cup of each) into 6 microwave safe bowls. Cut the butter into 1/2 tablespoon pieces and set one piece in each bowl of marshmallows. Heat each bowl on high power for 45-75 seconds until melted. Repeat, melting all the marshmallows. Add purple coloring to one bowl and stir until well combined. Add one of each of the remaining colors to the remaining bowls of marshmallow. Stir 1 cup of Rice Krispies Cereal into each bowl. Scoop the purple cereal treat mixture out of the bowl and stretch it out over the long edge of the prepared pan. Flatten it into a 2 inch wide strip. Add a blue strip next to the purple one then add a green, then yellow, orange, and pink strip. Press the seams together so the colored strips are well sealed. Run a knife or plastic scraper around the edge of the pan loosening the cereal treat. Carefully flip the pan over allowing the rainbow rice krispie treat to fall out onto your work surface. Peel the paper off the treat. Begin rolling the treat along the long edge (either the purple or pink strip). Roll it, pinching together any cracks, until you have an 18 inch long log. 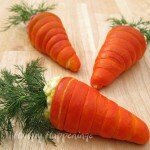 Using a sharp knife, cut the roll into 12-18 slices and they are ready to serve. 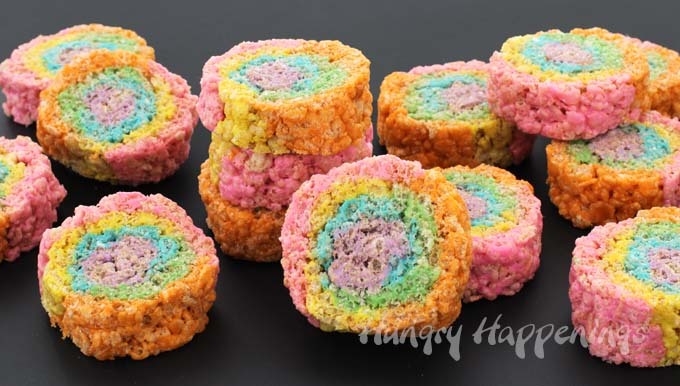 Will you make these Rainbow Rice Krispie Treat Pinwheels for Easter, St. Patrick’s Day or a birthday party? Let me know in the comments below. See all of my Easter recipes, here and all my St. Patrick’s Day recipes, here. 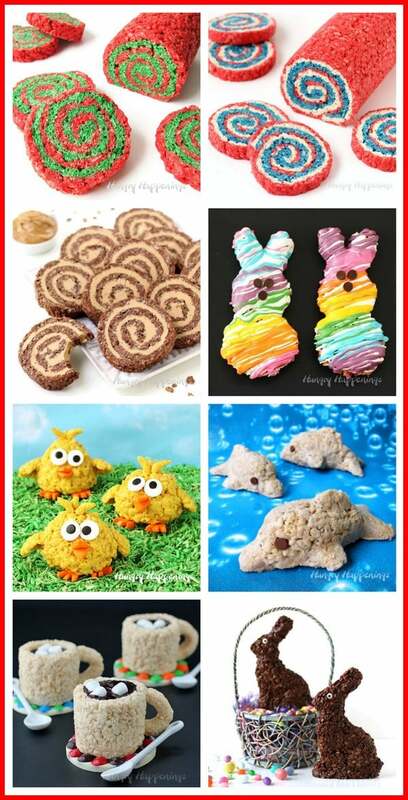 You might also like these other fun Rice Krispie Treat recipes and food crafts. I love how you rolled that rainbow into one adorable treat! Thanks!!! I’m glad you like them. If you made it the day before, would you leave it whole and wrap it, or go ahead and slice? 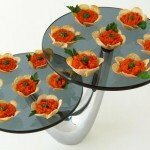 I think either way would be fine as long as your store the treats in an airtight container. 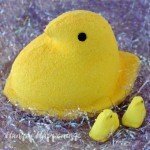 If you just plan to wrap it in Press ‘n Seal or Tin foil then leaving it whole would be best. Enjoy!